If you’re looking for professional carpet cleaning in Gloucester, then look no further. 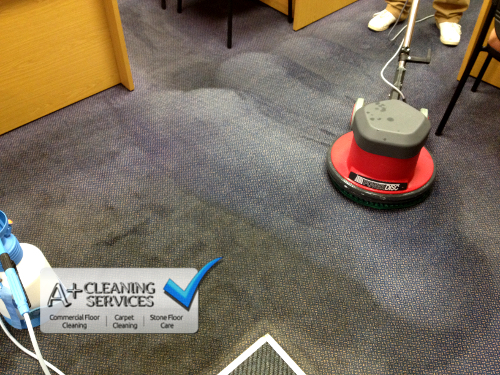 We offer you our expertise in both domestic carpet cleaning and commercial carpet cleaning Gloucester. We also offer you advanced stain treatment and stain protection to help you keep your carpet in tip top condition. Commercial business properties we can carpet clean are offices, schools, restaurants, pubs, hotels, retirement homes and local authority. What we can do for you will be explained in greater detail for you further in. 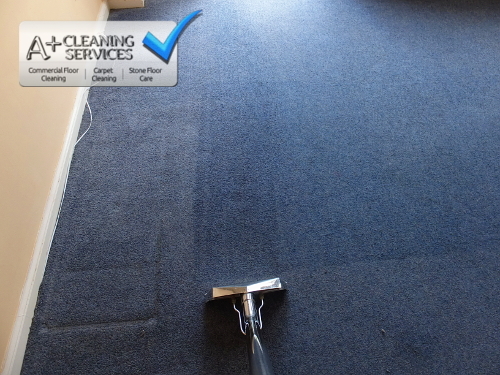 Carpet Cleaning Gloucester – This blue wool carpet is quite old and crying out for some TLC. 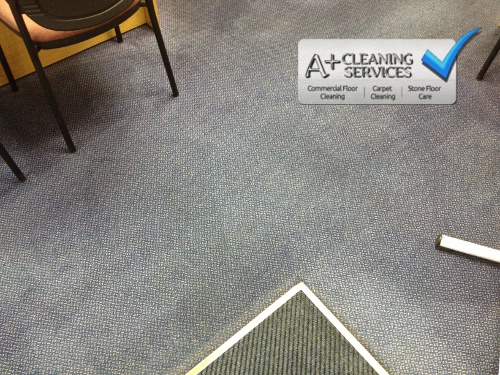 Carpet Cleaning Gloucester – In this photo the cleaning solution has been applied to the left hand side of the carpet. Carpet Cleaning Gloucester – As you can see, the last stage of the carpet cleaning is in progress, removing all grime and moisture. 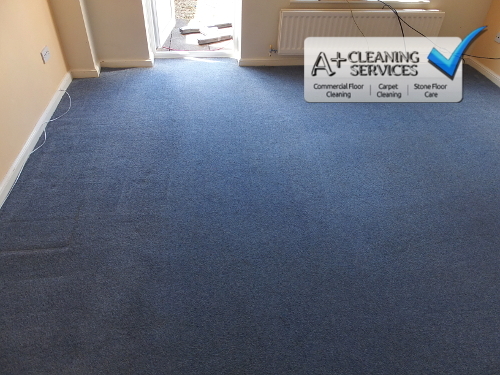 Carpet Cleaning Gloucester – Here is the end result, a bright, brilliant blue carpet. If your carpet looks like this carpet pictured above, our modern carpet cleaning science would work its magic on your carpet. You can see the results for yourself presented across the page. We shun detergents in favour of a far more sophisticated carpet cleaning solution. At this point, you’re probably scratching your head wondering; “Aren’t detergents the best?”. The answer is NO. Today we no longer remain in the grip of sticky residual detergents (pun intended). Detergents are sticky by design. When something is sticky you either cant remove it or you need additional chemical to rinse it out of the carpet. Both these scenarios can result in damaging and unhealthy chemicals sitting in your carpet. This leads to faster re-soiling of the carpet. …and the science behind it. Our unique cleaning solution is colloidal. Colloids behave entirely differently to detergents, which is what makes them so functional. Colloids work by shattering dirt molecules, releasing their grip on carpet and other surfaces. As they smash into soil, allergens, dustmites, VOC’s, microbes, the offending molecules/pests are held in suspension. This suspension means that the chemical is free-rinsing, not sticky, and will even help dry the carpet. From here the carpet is rinse extracted, removing all the grime and cleaning solution. The end result is a clean sanitised carpet, looking brighter, feeling softer and smelling fresher. 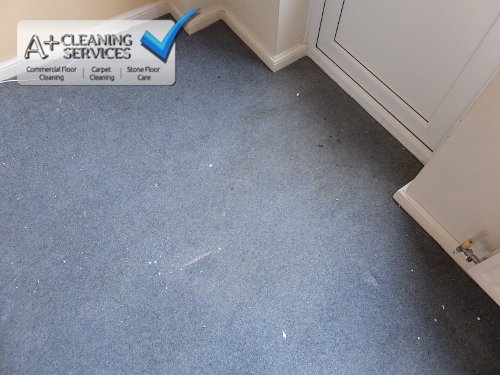 Carpet Cleaning Gloucester – This office doorway certainly picked up plenty of dirt off the streets. Areas like this require annual maintenance cleaning as a minimum for optimal appearance and health. 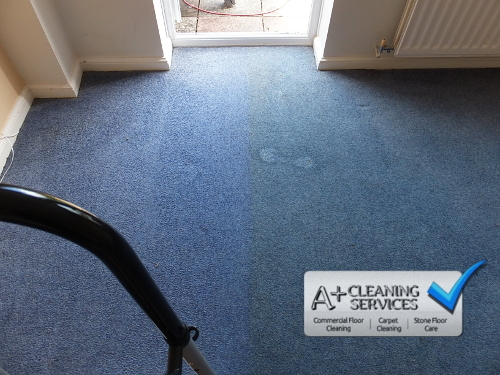 Carpet Cleaning Gloucester – Keep your carpets looking like this all year round, making a good impression on your customers. The approved carpet cleaning method for commercial properties is a low moisture system. This method allows us to cover a large area quickly, whilst removing dirt. This method is extremely efficient, using 90% less water than conventional water extraction methods. This in turn means your carpet will be dry and fine to walk on within moments. Our method gives us the ability to give you a fast turnaround outside of business hours, for your convenience. For commercial properties we give you a free survey in which we calculate the area to be cleaned, plus identify any potential problems. You will be given a quote based on all these factors. 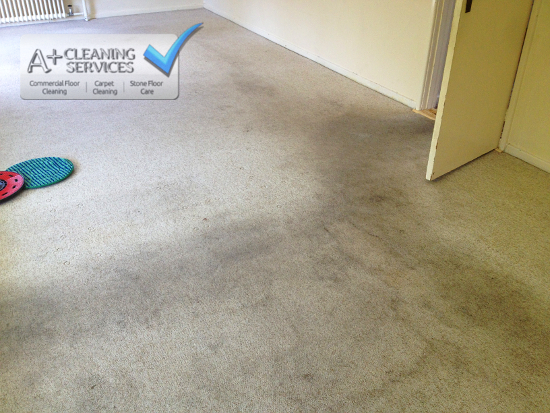 Carpet Cleaning Gloucester – Before cleaning. 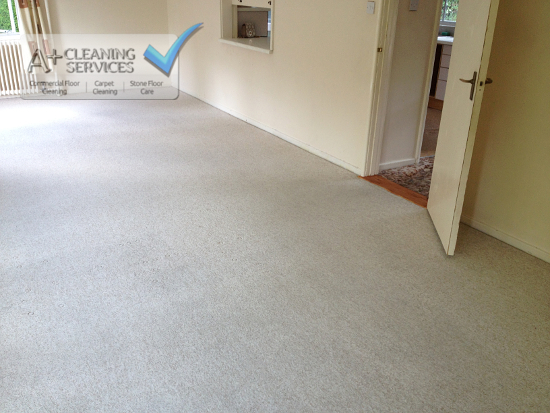 Carpet Cleaning Gloucester – After carpet cleaning. Head to our blog and see even more examples of what we can do for you. We have more professional carpet cleaning Gloucester photos and photos from other local areas too. Each blog post explains in depth more about the situation, so if you have a similar problem, you know who to turn to. Also coming soon, tips and home remedies for customers on how to limit damage from emergency stains, gaining time before having them professionally cleaned.